Between the 1920s and the 1930s, Los Angeles possessed a wealth of restaurants and diners, each with their own theme or gimmick. 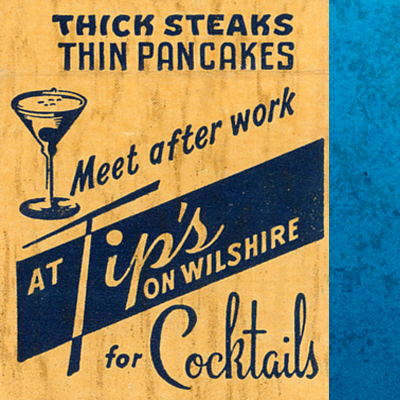 For Tip’s Restaurant, it was “Thick Steaks, Thin Pancakes.” A New York Cut steak was 90 cents during Tip’s heyday in the 1940s, while the Little Thin Pancakes were only 15 cents. A Tip’s also featured a small bar for cocktails. The L.A. chain got started in Hollywood during the 1920s, 100 feet north of Hollywood and Vine. Most of the locations were 100 feet north or south of some major intersection – another marketing gimmick. The Miracle Mile Tip’s was 100 feet south of Wilshire Boulevard off La Brea nestled on Pancake Alley. In recent decades the alley had shrunk into a parking lot entrance for a Bank of America branch that had expanded out into former small shops and eateries from the 1940s and before. Now the whole block has been demolished because of subway station construction for the new extension heading west towards Beverly Hills. Tip’s Restaurants could also be found in Santa Monica, Beverly Hills, close to the May Co. department store further west on Wilshire (now part of the L.A. County Museum of Art complex), and also in Leimert Park.